organized by Indian Maritime Foundation in association with Indian Coast Guard and Navy Foundation – Chennai Chapter. sponsored by IIC Technologies, Marg Karaikal Port, Michelin, Barbecue n Biryani. well managed by Mr Khalid A. Khan of Brainchild – Business Solutions Pvt Ltd.
flagged by Worshipful Mayor of Chennai Mr Saidai Duraisamy. Special Address on International Coastal Cleanup was given by Ms. Jennifer McIntyre, Consul General of the U.S. Consulate General in Chennai. Here are some interesting photographs. Address by Worshipful Mayor of Chennai Mr Saidai Duraisamy. Special Address by Ms. Jennifer McIntyre, Consul General of the U.S. Consulate General in Chennai. 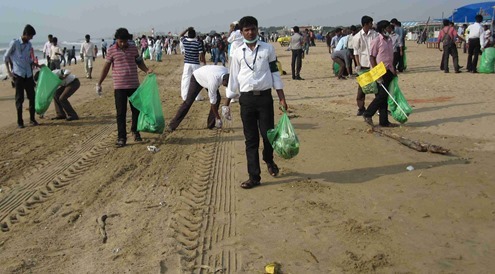 Details of Coastal Cleanup in Tamil Nadu given by Mr Khalid A. Khan of Brainchild – Business Solutions Pvt Ltd.
Vote of Thanks by Commodore (Retd) S Shekhar, Regional Director, National Maritime Foundation. 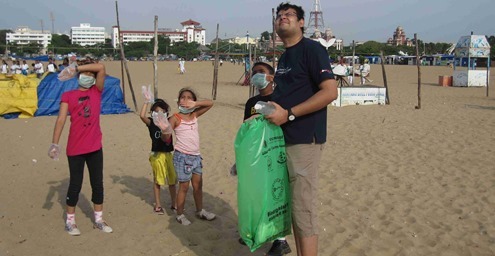 Part of the Volunteers involved in Coastal Cleanup. Cleanup of Marina Beach by School Children – 1. 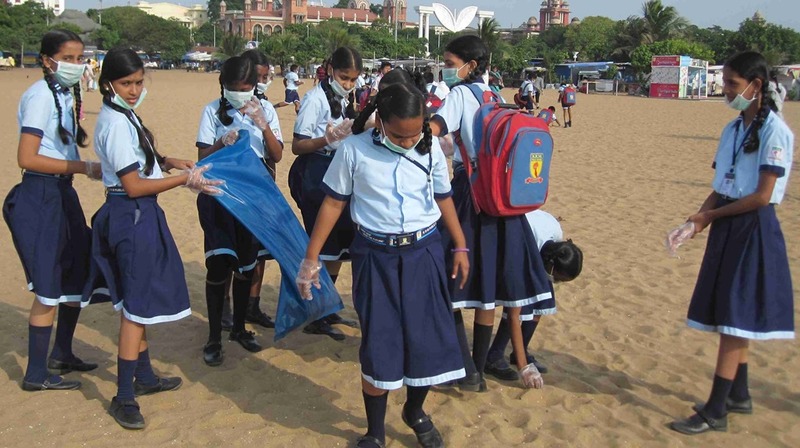 Cleanup of Marina Beach by School Children – 2. Aerial Survey of the Coastal Cleanup by Indian Coast Guard. Children are thrilled to see the Coast Guard Helicopter. 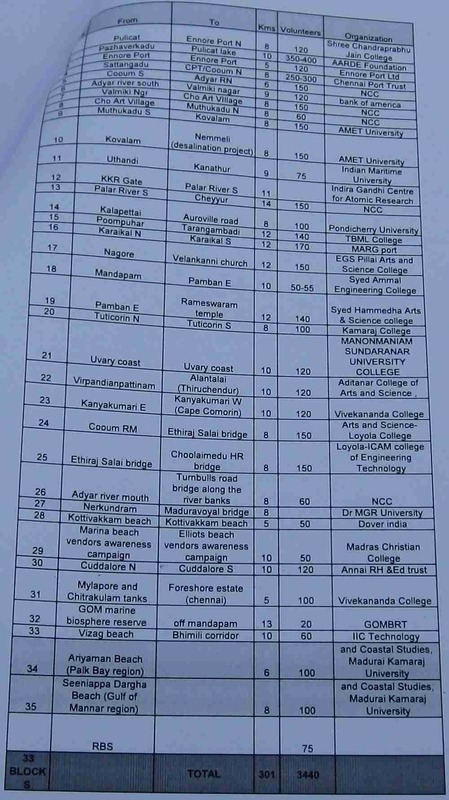 Here is the list of other areas being cleaned up in Tamil Nadu today. Thanks to Mr Khalid A. Khan of Brainchild – Business Solutions Pvt Ltd and the organisers for creating an awareness on Coastal Cleanup. It is a matter of great pride to welcome you on board. Thank you for your neatly written piece about the ICC cleanup at Marina and other beaches. 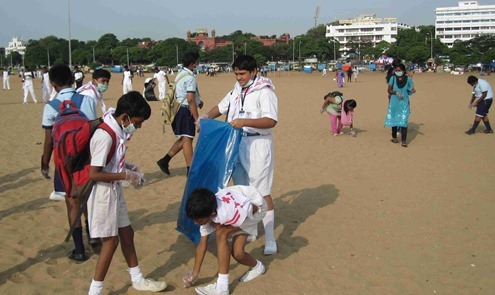 Perhaps Khalid or Shekhar may have mentioned to you that our goal is that this activity is not confined to being just an annual event, but a sustained dedicated and successful movement to improve the cleanliness of our country. It is important that we keep connecting with people who have the same goals, as there is strength in numbers and it is vital that we synergize our efforts and not work in our own cocoons. I look forward to connecting with you on email and for your support.